Losing Shaun Donovan at the helm of HUD was a blow for urbanists. This afternoon President Obama formally announced the nomination of San Antonio Mayor Julián Castro to replace Donovan as the Secretary of Housing and Urban Development. What will the transition mean for the agency, which under Donovan championed smart growth and the integration of transportation and housing programs? At HUD, Donovan was known to chastise the federal government for policies that encourage sprawl and disconnection. At a 2010 smart-growth conference, he emphasized one firm solution: “America must find a way to connect housing to jobs.” Under Donovan’s watch, HUD launched its Office of Sustainable Housing and Communities, which works with DOT and EPA to ensure that all three agencies mesh — rather than clash — in their decisions. With Donovan now expected to take a larger role in Obama’s administration with the top spot in the Office of Budget and Management, Castro is next in line for HUD. Now in his fifth year and third term as San Antonio’s mayor, Castro, 39, has risen to national prominence in Democratic circles. This isn’t even his first chance at a cabinet role — he turned down a chance to become transportation secretary last year and has talked with Obama about the education post. Clues for how Castro would fare at HUD come from his record governing the country’s seventh-largest city. A San Antonio native of Mexican descent, the Harvard Law grad first joined the City Council in 2001 at age 26 — the youngest person in the city’s history to do so. He took over as mayor in 2009, presenting a bold policy vision to shape the next decade of the city’s growth. The fundamental goal of Castro’s SA 2020 plan is to transform San Antonio into a lively, economically competitive “brainpower community.” The plan aims to revitalize the downtown core and improve the streets, transit, and walkability. 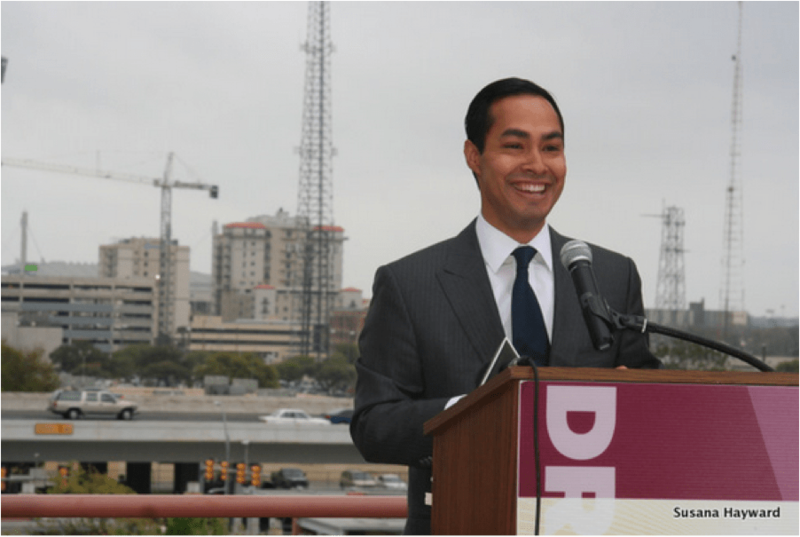 Castro coined the phrase “Decade of Downtown” for the growth process there, which aims to fill San Antonio’s urban core with 80,000 employees and 8,304 housing units by 2020. Between 2011 and 2012, San Antonio added 811 housing units downtown, and as of this winter 17 residential projects were underway with help from millions of dollars in incentives from the city. Another project in the works is the transformation of Hemisfair, the site of the 1968 World’s Fair, into a public park to lure real estate development with pedestrian-friendly avenues, cafés, and art. SA2020 also aims to change the way people move around, with goals like tripling transit ridership and the number of “complete streets” that accommodate walking, biking, and transit, as well as driving. As part of this, Castro has overseen the expansion of “B-cycle” — Texas’s first bike-share system — to 53 stations and 450 bikes today, with more to come. In general Castro has talked about a more “urbanized” direction for Texas as a state, as its cities attract transplants from coastal areas. At HUD, Castro would be working alongside another expert with on-the-ground urban experience: Harriet Tregoning, the former DC planning director, who now directs HUD’s Office of Economic Resilience. San Antonio is far from Texas’s 7th largest city. It’s actually #2 in terms of population. You’re right; it’s the nation’s 7th largest city. Thanks for the heads-up; we fixed it in the story. Clues for how Castro would fare at HUD come from his record governing the country’s seventh-largest city.